The purpose of this page is to provide information about secondary suites in the RDN. This information is intended to assist property owners wishing to construct a secondary suite and provide direction and assistance to property owners who have an unrecognized secondary suite. Secondary Suites are not permitted in all other zones, unless specifically listed as a permitted use in that zone. 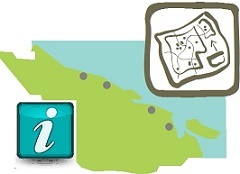 Our mapping tool, RDNMap, can be used to determine if a property may be located within the reserve. See buttons below. Please note that this information should be confirmed with the ALC.